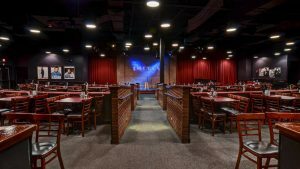 Located in the bustling Waterfront shopping area featuring over 70 stores, restaurants, hotels and entertainment venues along the Monongahela River, the Pittsburgh Improv is an ideal setting for corporate events, wedding receptions, business meetings, fundraisers and more. Pittsburgh has recently emerged as one of the leading cities in the tech industry, hosting offices for Uber, Google and others. The club recently expanded its theater and has added an outdoor patio and bar. The venue can comfortably seat 400 patrons with plenty of parking throughout the Waterfront area. The club is able to facilitate a wide variety of presentations as well as support both live music and DJs. Which part of the venue would you like to book? Thank you for your submission. A representative will call you as soon as possible. Your business is appreciated very much.